My hubby loves, loves, loves oatmeal raisin cookies! When I make this chewy oatmeal cookie recipe, I usually made a quadruple batch just so he gets some, since the kids are pretty sneaky about not even letting them cool off before they are scarfed. This is one of my favorite recipes of all time, and the best part is that this recipe for oatmeal cookies is gluten free! How about that, right? What could be better to enjoy fresh baked oatmeal cookies than a cold glass of homemade almond milk? (Get that recipe here.) Oatmeal cookies make a great snack for after school or activities. With the all natural sugars, they become more healthy oatmeal raisin cookies. Start by adding 1 cup of oats to a food processor or blender and whir until it’s a flour texture. Add the cinnamon and baking powder and whir for another moment to mix. In a mixer on medium high speed, cream the butter and sugars together. Add the egg, vanilla, and salt and mix well. Add the flour mixture 1/4 cup at a time, until combined. To give these old fashioned oatmeal cookies as a gift in a jar, simply add the dry ingredients to a quart sized jar or bag, label with remaining directions. Add butter, eggs, and vanilla when baking. What is your favorite cookie? 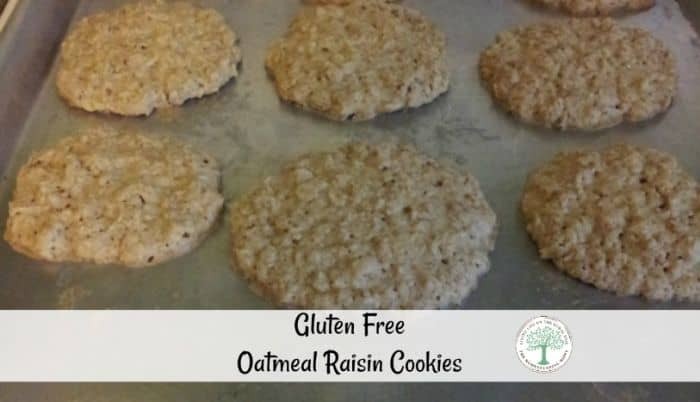 Would you like to try this gluten free oatmeal raisin cookie today? Be sure to pin this for later! Oh those look delicious! If one were to be feeling too lazy to drag out the blender and make flour out of some of the oats, could one just substitute the same amount of a gluten free flour, perchance? My husband and son love oatmeal cookies! We don’t follow the gluten free lifestyle but it certainly won’t hurt anyone to eat healthier without all the processed stuff, right? Thanks for sharing this recipe, I’ll let you know how it turns out. Oh my Gracious! I didn’t know my favorite (and only) granddaughter could make yummy, mouth-watering oatmeal cookies! I have printed her recipe and will have it , and my blender, on my kitchen counter when she next visits me in Florida. In case she doesn’t notice them I will have all cabinet doors open so she can’t miss the flour, sugar and all that other good stuff she puts in the cookies. Think she’ll take the hint…? I got your recipe from Melissa K Norris podcast and made them yesterday. I used quick cooking oats, preheated the oven and used cooking spray on the pans. Recipe didn’t state either way. When I placed them on the cookie sheet, they were formed perfectly with a tablespoon, when I took them out of the oven they had ran into each other. I had one large, very flat, over cooked mess…..What happened?! it is honestly hard for me to say without having been there. They DO spread a bit because of the butter, but I have never had a flat mess like you are describing. Recipe looks delish but I have a question. stir in remaining oats. Does this mean more than the 2 cups of oats that are blended into flour?